English Heritage say that "this great abbey, marking the rebirth of Christianity in southern England, was founded shortly after AD 597 by St Augustine. 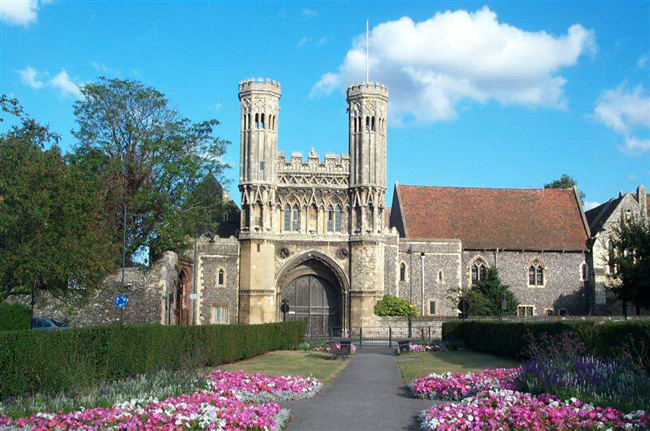 Originally created as a burial place for the Anglo-Saxon kings of Kent"
It is part of the Canterbury World Heritage Site, along with Canterbury Cathedral and St Martin's Church. From records we know it existed by the time St Augustine died, as he was first buried outside in the grounds of the abbey church of St Peter and St Paul, and later in a section within the abbey. However this may have been because it was still being constructed at the time of his death. More on the the arrival of St Augustine, and events at that time are covered in the location guide on the nearby St Martin's Church. Wikipedia says that when St Augustine's arrived there was already standing on the site, three Saxon churches, dedicated respectively to Saints Pancras, Peter and Paul, and finally Mary. One of the main purposes of the abbey right from the outset was as a burial place for the Kings of Kent and the Archbishops of Canterbury. In 978 a new larger building was dedicated by Archbishop Dunstan, to the Saints Peter, Paul, and Augustine. St Augustine's was a Benedictine abbey, a lot of building and rebuilding occurred, some as a result of a fire in 1168, and from 1250 a flurry of activity building cloisters, lavatorium, frater, kitchen, abbots lodgings and a great hall. The grounds were extended and new outer walls put up in the 14th century, and building included a crenellated great gate, cellars, range, brewhouse, bakehouse and in 1320 a new vineyard was added. An earthquake in 1382 brought about repairs and changes. The current surviving gatehouse was built in 1390. The lady chapel was also added to the end of the church. By 1500 the abbey was large prosperous and had a library with over 2,000 volumes. At its largest, its church was nearly as large as the cathedral nearby. In the time of Henry VIII, it escaped the first closures as it had an income at the time of £1,733, the first to close being those with an income under £100 a year. It was dissolved on the 30th July 1538, and parts removed over the next 15 years, but some parts remained intact and converted to a new palace, ready for the arrival of Ann of Cleeves from Germany. It was used as a palace by various nobles until a great storm in 1703 damaged it. Today a number of substantial buildings survive including the gatehouse, large window from the abbey church and other buildings. Getting there: A257 just east from Canterbury towards Longport. 1/4 mile east of cathedral. NO PARKING ON SITE - pay and display nearby. Notes: Museum. Free audio tour.